Credit cards are an active part of a modern woman's daily routine for paying for purchases. Nearly half of women use their credit daily or a few times per week. In order to earn consumer attention and share of wallet, credit card companies have to offer competitive benefits to cardholders in order to drive them to apply for their card. As part of the POPSUGAR Insights 2017 Personal Finance Report, we surveyed nearly 2,000 women between the ages of 18 and 44 to ask them how they manage their finances and think about their financial future. 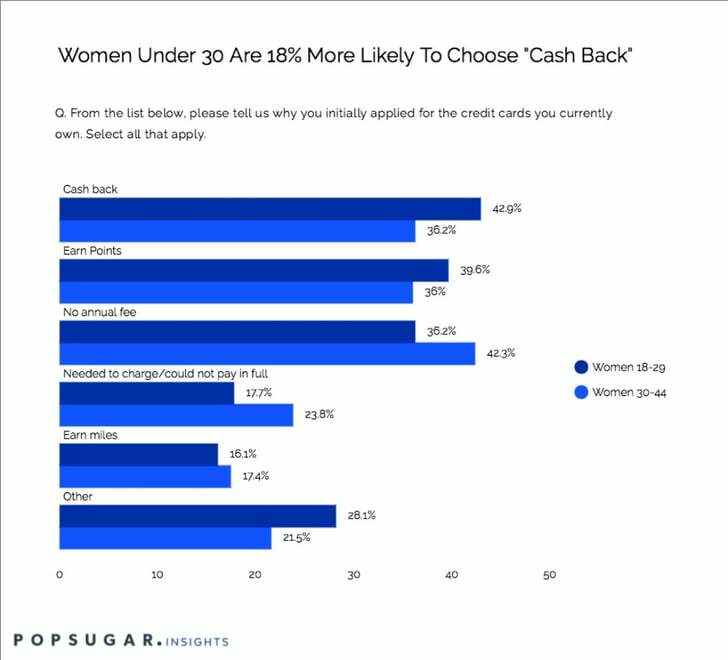 Overall, women between the ages of 30 and 44 were 17% more likely to seek out cards that offer no annual fee, whereas women under the age of 30 are more likely to seek out cards that allow them to earn cash back or points. Women between the ages of 30 and 44 were 34% more likely to have to have applied for a card because they could not pay their bills or expenses in full and needed to charge them. Once the application has been approved and women begin using these cards on a weekly basis, it can be important for them to understand successful strategies to earn, manage, or redeem the points, miles, or cash back, and that can create an opportunity for endemic marketers who wish to continue the conversation with their cardholders while also creating opportunities to recruit new applicants.